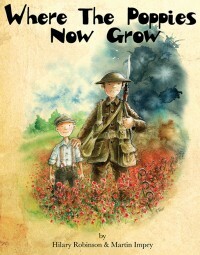 To mark the centenary of the start of the First World War one of the UK’s top creative teams, Hilary Robinson and Martin Impey, have dedicated their new book Where The Poppies Now Grow to their great uncles who fell at the Somme. Admiring of their devotion to duty, and deeply aware of the effect the deaths of their great uncles had on their grandparents’ families, they have combined their talents in a beautiful story of devoted friendship which is tested, but survives the tragedy of war. In tribute to the war poets of the time, Hilary’s work of fiction is written in rhyme, and is set in a bygone age. Martin, who previously illustrated War Horse for OUP, has with illustrious artwork captured the very essence of the time, the innocence of childhood and the courage of those in battle. In short Where The Poppies Now Grow is a celebration of the human condition. one which touches our hearts.